After reviewing over 6 hiking shirts for a total of 12 hours, we have come to the conclusion that the Columbia Men’s Silver Ridge Long-Sleeve Shirt is the best in this category. A number of factors that work in its favor include the quality of fabric, durability and the strategic design. For a more affordable option, it is better to go with the ExOfficio Men’s NioClime Short Sleeve Shirt. It offers almost the same comfort as an expensive hiking shirt without burning a hole in your pocket. 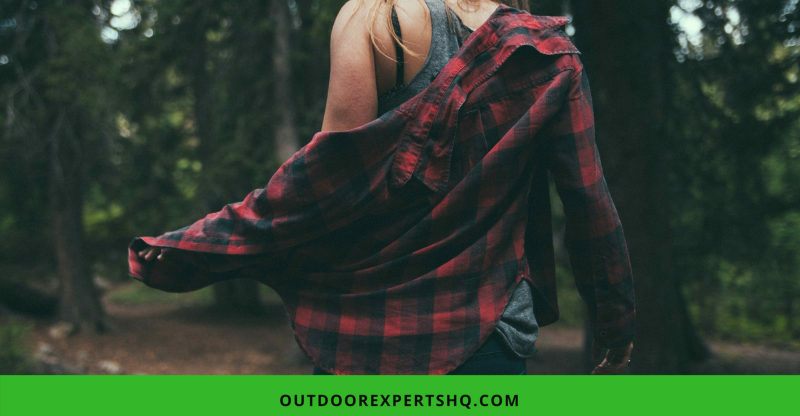 Let us explore further the uses and benefits of using the hiking shirt. The only women’s hiking shirt that made our list is the White Sierra Women’s Gobi Desert Long-Sleeve Shirt. A hiking shirt is designed specially to withstand all kinds of challenges in a hot and humid weather. It needs to be breathable, soft on the skin and noiseless when it gets any kind of friction. All these qualities are a must in any useful hiking shirt. The two main kinds of fabrics used in the creation of hiking shirts include the Polyester and the Merino Wool. This is because both of them possess the desirable properties of being breathable, moisture-wicking and quick drying. But they also have their own share of downsides that need to be considered before making the final decision. Polyester hiking shirts excel when it comes to being quick to dry and minimal moisture retention. However, we need to spray them with an anti-microbial agent to make then odor-resistant. The breathability of this material also lacks greatly in comparison to the Merino Wool. Merino Wool might be a bit expensive but it gives that luxurious comfort throughout the hike. Extremely soft to touch, breathable and impressive odor resistance makes this fabric all the more useful in a hiking shirt. It is not as durable as its polyester counterpart but blending it with the nylon fiber can compensate well for it. 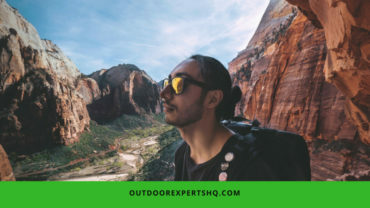 Since most of the time is spent under the sun during hiking, it makes total sense to go with the hiking shirt that offers sufficient sun protection. These shirts usually come with the UPF – rating that defines how effective it is against the UV rays. For example, the UPF 20 rating suggests that this shirt leaves out just 1/20 (≈5%) of UV-rays while protecting us against 95% of them. This rating is dependent upon a lot of factors including the condition of the garment, weave tightness, fiber type, treatments, amount of stretches and other similar factors. During peak summer weather, it is always better to get 2-3 layers of thin and light hiking apparels with a good UPF rating to keep ourselves protected from the sun damage. These hiking shirts also work just as fine for other intensive outdoor activities. Being noisy and rough to touch is a dead giveaway of a cheap fabric. The shirts that make a lot of noise on our movement or when rubbed together are usually made of substandard nylon fiber. It does not feel comfortable to wear and has this grainy feel to it. The texture depends upon the quality of the nylon fiber being used. A shirt made from premium quality nylon fiber is extremely soft on the body and is completely noiseless. It offers all the benefits of a nylon shirt together with the comforts of a suitable hiking shirt. The noisiness of the fabric points out various other problematic issues that can make that specific hiking shirt a total disaster to deal with. That is why it is important to take this parameter into account and always opt for one that is gentle on both body and ears. Each hiker has his or her own list of preferences when it comes to hiking shirts. The pullover vs button down debate also does not have a clear winner. Some people prefer the options that come with the button down shirts that let us open it partly or even completely to get some cooling breeze. Whereas the others prefer the rough and tough exterior of the pullover layout that leaves no room for any creepy crawlers to irritate us in the wild. And if it is made up of a suitable breathable material then we will have no problem keeping it on throughout our trip. The number of pockets is higher in a button down shirt. That makes them suitable for those who have to carry all their knick-knacks with them on the hike. The separate pockets also let us keep all the relevant items together at the same place without mixing them up haphazardly. Since we are already on the topic of pockets, it makes total sense to evaluate their purpose in a hiking shirt. For some, it is unnecessary and ruins the basic structure of the shirt. Also, this way they cannot be seamlessly used for the casual get-together where the giant baggy pockets turn out to be too distracting. But, it is always better to pick a certain purpose for each garment so that it can at least serve one purpose successfully. This is why it is better to pick hiking shirts that have at least two large chest pockets. And beyond that, the number of pockets totally depends upon your requirement and preferences. We can safely keep our digital camera, sunglasses, bug repellent and maps in these pockets among other things. All the pockets can be of a medium size so that the functionality of these pockets do not totally eclipse their aesthetic appeal. We have a lot of suitable options when we go out to buy the hiking shirt of our choice. Below, we have compiled together our top 6 picks. This shirt will be your ideal partner for all those endless roads to the pinnacle. Crafted out of the exclusive Merino wool, it delivers unparalleled performance with every stride we take. This fabric lets us breathe, stay dry all day and give us the softest feel so that we can stay comfortable on every single trip with it. This shirt is made up of 100% Merino wool for the exemplary quality. Has been knit in Vietnam to provide us that ultimate quality in stitch and finish. Comes with a form-fitted look that is made better with the interlock knit. The stylish design of the shirt comprises set-in sleeves and crew-neck. Chaffing problem is eliminated completely with the help of flatlock seam construction. It is a bit heavier especially for those people who prefer to pack and travel light. Comes is comparatively larger sizes that might not be an ideal situation for people looking for that perfect fit. The hiking shirt gives an advantage to athletics with its superior fabric quality and the fitted form. It has been specially designed for the purpose of train running that works in favor of the hikers. Exceptional moisture management makes it our perfect hiking partner for every season. With the gusseted underarms, we can continue with our hike without getting bothered by the sweat and odor problem. Fit and comfort come naturally with the anatomical shaping of this shirt. Even in low light, the visibility of this shirt is enhanced with the help of its reflective blazes. Unrestricted mobility is ensured within it thanks to the mechanical stretch textile. Comes with the appreciable UPF 20 rating and the premium blend of 70% polyester and 30% polypropylene. Hand washing degrades its quality by quite a margin. The price is quite steep for the quality of fabric that we customers ultimately receive. The Long sleeved shirt comes with a rugged look that suits the mood of your next adventure. You can just put it on and take the next challenge head-on without worrying about the trivial things such as moisture management, sun protection, and other similar factors. Sun protection collar makes sure that we are protected from the harsh UV rays at every angle. The Omni – Shade technology comes with the UPF 50 rating for optimum sun protection. Advanced evaporation of all the locked and sealed moisture is ensured with the help of Omni-Wick technology. The composition of the fabric is 86% Polyester and 14% Elastane which is responsible for all of its desirable properties. Double flap chest pockets, long convertible sleeves, tab keepers and the relaxed fitting of this shirt makes it perfect for every challenging weather condition. The fitting of the shirt is too snug to wear it all day on a physically demanding activity such as hiking. Holes for the buttons are too small and the overall stitching can also use some improvement. Designed keeping in mind women on the move, it comes with UPF 30 rating and many other outstanding qualities that come handy during hiking. Its entire layout has been created in a way to optimize the moisture wicking process and minimize the overheating. The back mesh venting keeps us cool and dry while we are dealing with that steep uphill route. Made up of 100% polyester, the easy hand washing and quick drying properties make it a must-have for all our upcoming hikes. It comes with tab sleeves with point collar to make the entire look even more stylish. Moisture-wicking fabric frees us from all our odor and sweat retention problems. The pockets come with a zipper which makes them extra safe to place all our valuables in. Wrinkling problem might make it unusable for people who like to maintain a put together look during their hikes. The breathability and wicking properties of the fabric are not as efficient as marketed by the manufacturers. Merino Wool gives this shirt all the amazing qualities that we have always desired in a hiking shirt. It is perfect for hiking in both hot and cold temperatures. Moisture control, soft to touch and quick to dry is few of the many characteristics that make it perfect for all sorts of outdoor activities. The harmful effects of the pack rub are totally avoided with the help of offset shoulder seams. Durability is enhanced for this fabric by using merino wool that is wrapped around a nylon core. Standard composition of this fabric is 87% Merino and 13% Nylon corespun. This jersey weighs just 150gm which offers us the lightweight comfort that we desire on our hikes. Can be worn to a variety of activities including running, mountain biking, hiking, trekking and just roaming around. Some customers are complaining that the fabric is itchy and rough, unlike the Merino Wool fabric. Different colors show varied performance level thus making the performance consistency uneven across the whole range. The shirt comes with the Dri-release technology which is responsible for keeping us cool and dry over the extended period of time. It gives us that familiar comfort that we expect to form its relaxed fit couple with many other exciting features that make it a worthy purchase. UPF 20+ rating makes sure that we get maximum protection against the harmful UV and UVB rays. The composition of this fabric is 85% polyester and 15% cotton. This jersey dries almost 4 times faster than its cotton counterpart. FreshGuard treatment makes sure that the freshness is retained while keeping the bad odor at bay. Chaffing is prevented completely with the help of flat-locked offset shoulder seams. Some customers are complaining that the quality of the material is not up to the usual standards of this brand. After washing a couple of times, the material might get snug on the corners making it uncomfortable to wear. What we wear matters the most during those long and adventurous hikes. That is why it is important to pick the right fit and fabric when it comes to the hiking shirts. A perfect example of an adventure-ready gear is Columbia Men’s Silver Ridge Long-Sleeve Shirt. This brings us to the end of this post. Share it on your socials with your friends and family to let everyone know the dos and don’ts of hiking shirts. Have you maintained a hiking shirt collection? Are you planning to start one after reading this article? Tell us all about it in the comment section below.